Posted December 2, 2015 by HPGhotrodLogin & filed under Uncategorized. Over the years I have taken many photos of old cars and junkers. The most interesting ones are the survivors that still run and are being driven, if only to cars shows but still road worthy. At the Grand National Roadster Show 2015 there were a few really neat cars that had apparently survived somehow and somewhere and the new owners got them running again. Some have been modified with newer drive trains but they still have that original patina appeal. This is so popular with hot rodders, car-culture addicts and of course, me too! It’s amazing how much a little rust will do for the interest level of a car. I have also included a few photos from an estate auction in Central CA where the man had dozens of cars and trucks that all sold in one whirlwind day. 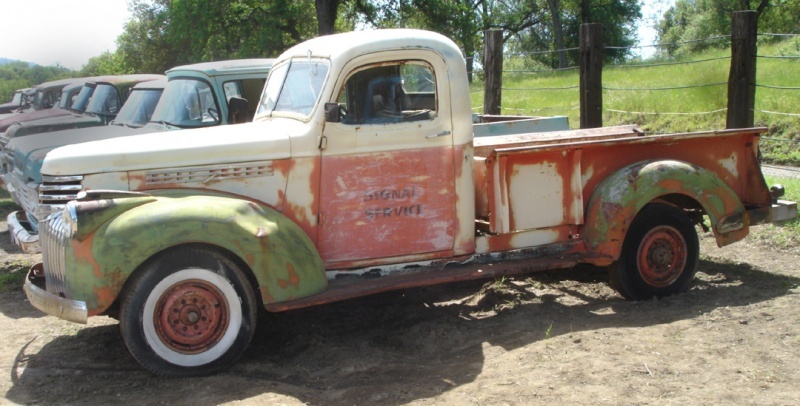 One of the highlights for me was an old Chevy pick-up that was once used as a service truck at a Signal gas station. The paint was extremely faded but I think it was originally green then painted red and white or red and yellow. The bed was missing most of the wood. I could barely make out the phone number on the door. It astounds me how many survivors have been found and I’m sure many more yet to be discovered. I have a few “pocket listings” of cars that I know are around and available but I’m keeping their locations to myself for now. You’re probably doing the same thing! 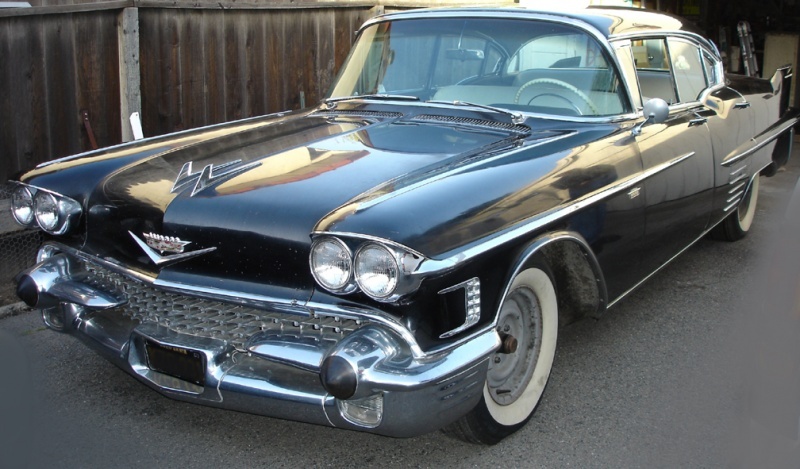 One example is the ’58 Cadillac Series 62 sedan. It belongs to a friend and was her grandfather’s car. It was originally white then was repainted black very early in it’s life. It has been garage kept most of the time. A nice running car with great upholstery. I sure wish they’d sell it to me but sentiment generally isn’t for sale. It is a complete car and the hubcaps were in the trunk. They brought it out of the garage for me to take the pictures. I hope you enjoy these original old cars as much as I do. 2015 GNRS. A nice little ride only $35K! 2015 GNRS ’29 Ford roadster. 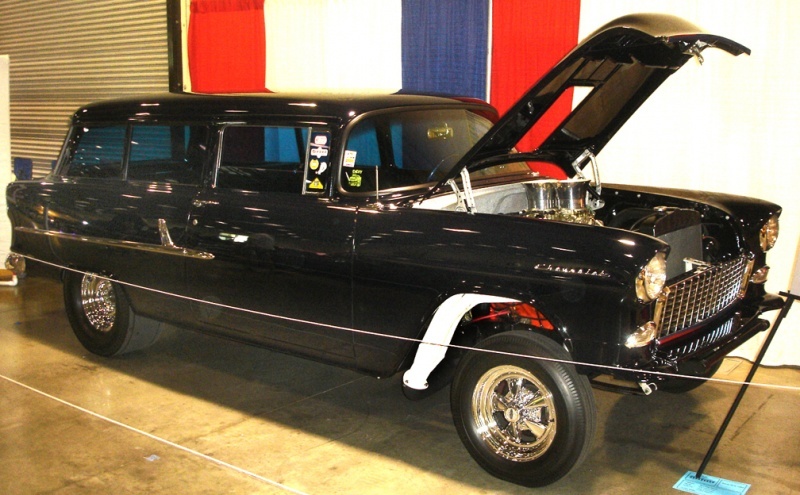 2015 Grand National Roadster Show featured car. Too cool for words. 2015 Grand National Roadster Show in the Suede Palace. A ’34 sedan ready to haul the family to church on Sunday. 38 Ford wagon at the 2015 Grand National Roadster Show. I don’t know if it was real but it got my attention! ’54 Chevy at the 2015 Grand National Roadster Show in the Suede Palace. This was parked outside in between the buildings at the 2015 Grand National Roadster Show. Great bustle-back Dodge and a slick 57 Lincoln sedan. Original 58 Cadillac series 62 sedan near the bay in Central CA. Posted July 6, 2015 by HPGhotrodLogin & filed under Uncategorized. The ’49 Mercury is probably one of the most recognized cars in the world. It was originally supposed to have been the new Ford according to several sources. But the body went to Merc and Ford got the new famous “shoe-box” styling. When I was going through my old magazine collection I remembered I had an issue of Science Illustrated. No, I had never heard of that magazine before either and I must have bought it at a yard sale or something with a stack of other mags. 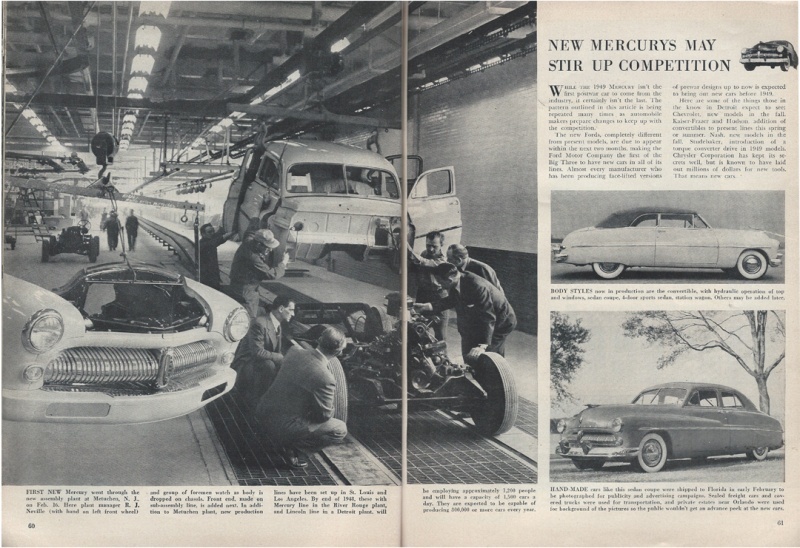 The May 1948 issue had a very interesting article about the styling of the ’49 Mercury. Inside were photos I had never seen before and found it to be totally fascinating. I already knew how automobiles were designed and produced but to see the ’49 Merc going through this process was a rare treat. 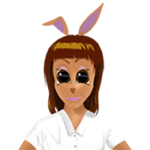 So I thought I’d share it with you here on the Hot Rod Bunny blog. The cover is the first thing that grabs you. A very accurate plaster ¼ scale model is being painted bright yellow. There is something unusual about it that is hard to notice at this angle but you’ll see it in the other photos. There are a few sketches that are seen in the background but can’t really be identified. The designer is working on a front ¾ angle and it already has the Merc look. The photo of the full size airbrush illustration is one I have seen before. 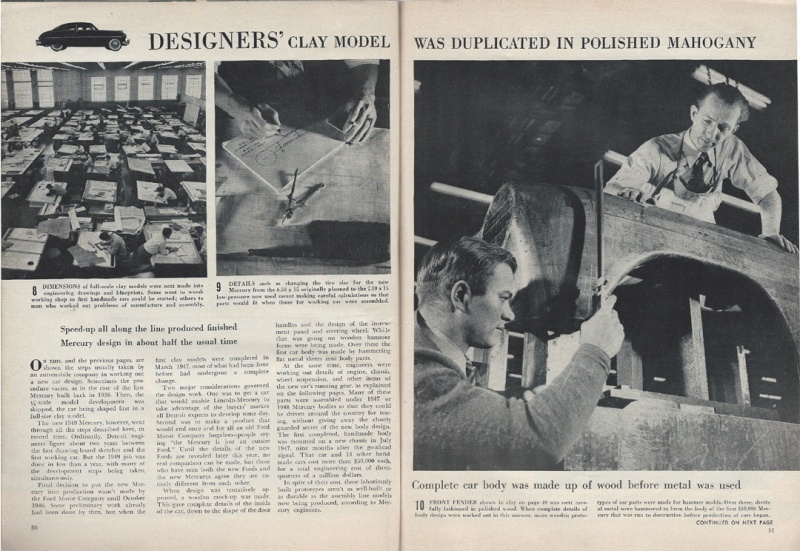 The shots of the beginning of the clay model are pictures that I hadn’t seen before. Now look at the plaster body being pulled from the mold. Note that the car is a fastback! Many other cars offered fastback designs in ’49 but not the Mercury. If you were ever curious about what it would have looked like…there is what they were thinking! The brand survived fine without it but after seeing it you have to wonder what it would look like with a chopped roof! After the full-size clay was made they transferred the dimensions to the pattern department to make the car out of mahogany. It wasn’t for the sheer purpose of making it out of wood. 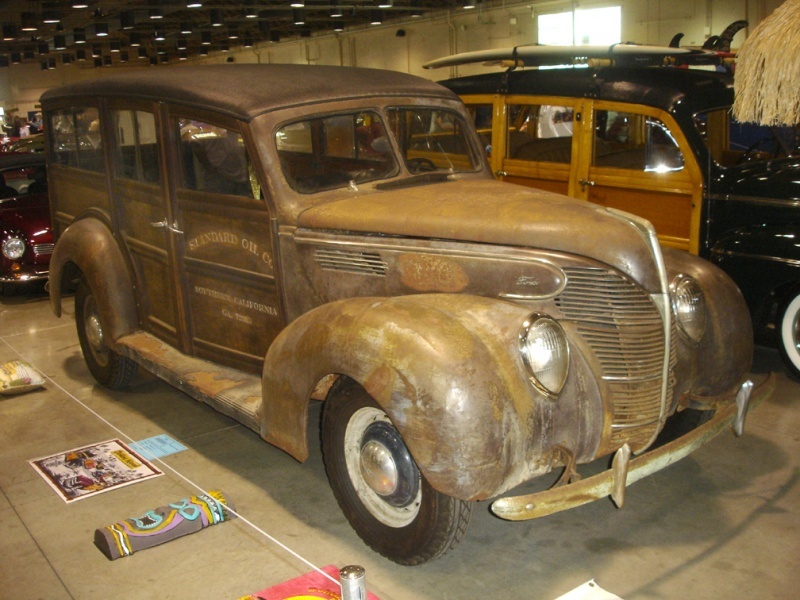 They used that tough wood pattern to hammer sheet steel into the shape of the car. The metal one-off was then assembled and tested. They need to make sure it can be put together easily and find out where the weak spots are. The one-off is usually not as good as the production version and is discarded after they’re finished with it. Finally we see one of the first production cars being built. Note it’s a four-door sedan, the bread and butter part of the line. That shot is the beginning of the legend. I wonder how many Mercurys rolled off that assembly line and are still around in one form or another? 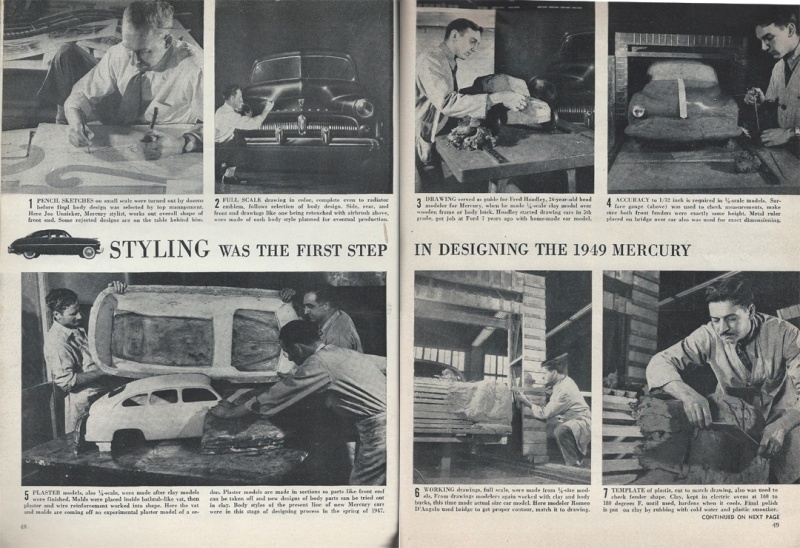 That’s a look at Science illustrated’s May ’48 article on styling the ’49 Mercury. Now you know what magazine to look for next time you’re at a yard sale or flea market! 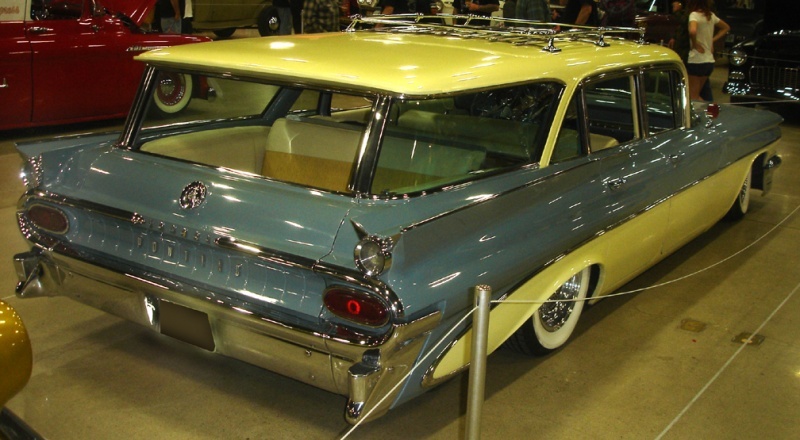 Station Wagons at the Grand National Roadster Show. Posted April 25, 2015 by HPGhotrodLogin & filed under Uncategorized. 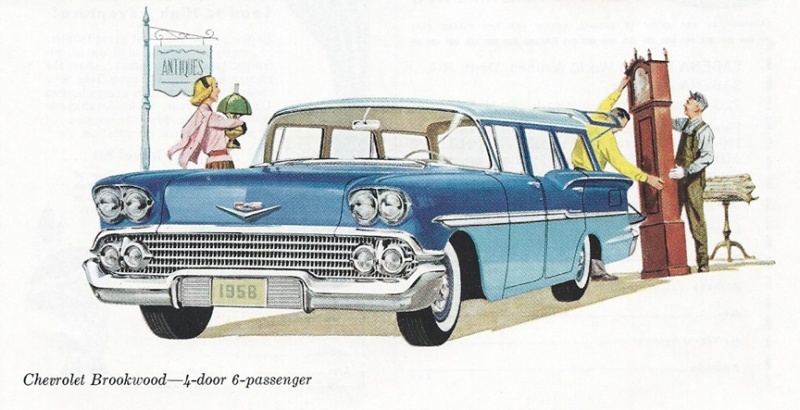 It’s kind of a curious thing but as a kid I never thought much about station wagons. 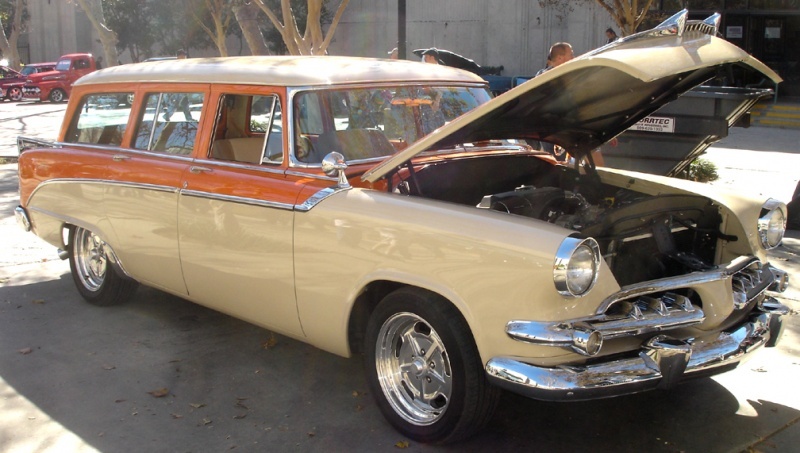 My dad had a red and white ’55 Chevy Belair wagon when I was growing up. It was a great car and he swore it was the best car he ever had! But wagons were just a part of the landscape back then. I found that as I got older I began to get nostalgic for those huge behemoths. It started when a close friend bought a used car to get around in. 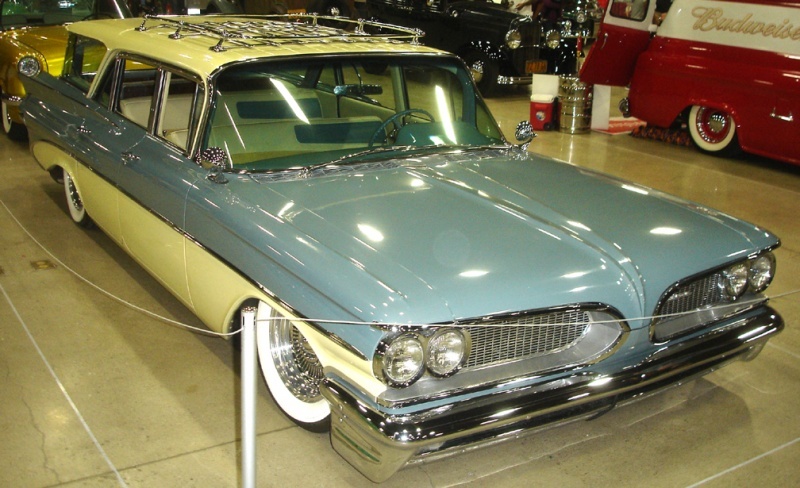 It was a ’60 Pontiac wagon and it was in remarkably good condition. This was about 1975. He was concerned with making it look cool and like a kid’s car. I thought it should be preserved exactly as found. After I graduated from Art Center in Pasadena I began to look at collector cars to buy and enjoy. I did that with my dad who also loved the car hobby. Well about 1980 I found an old ’58 Chevy Brookwood wagon sitting in a backyard. It had been re-painted “appliance white.” In other words, a very bright non-automotive color. It looks great on refrigerators though! The Chevy belonged to an elderly man who was a real tough deal maker. I eventually talked him out of it and my dad and I drove it home. I was convinced it was a clean one-owner, California car. After all, it ran good and had a coveted 348 with a four-barrel! We stopped at a gas station to make sure we made it home and I got curious. I looked more carefully at the clean back seat area. Then I lifted up the big rubber mat on the floor to see what kind of condition the original carpet was in. To my horror there was no floor under the mat! I was looking at the cement driveway under the car! The man had placed a couple of oven racks to span the gap and then set the mat over it! Talk about crestfallen! After that revelation, I decided to just sell the car and fortunately, I got my money back. I had looked at the car through a romantic haze and didn’t check it out well enough. That experience was embarrassing and somewhat humorous. Well, if had happened to someone else it might have been very humorous. But I could see the comic sense of it and the weird way the old guy dealt with a missing floorboard. I’m sure his wife wondered what ever happened to her over racks! 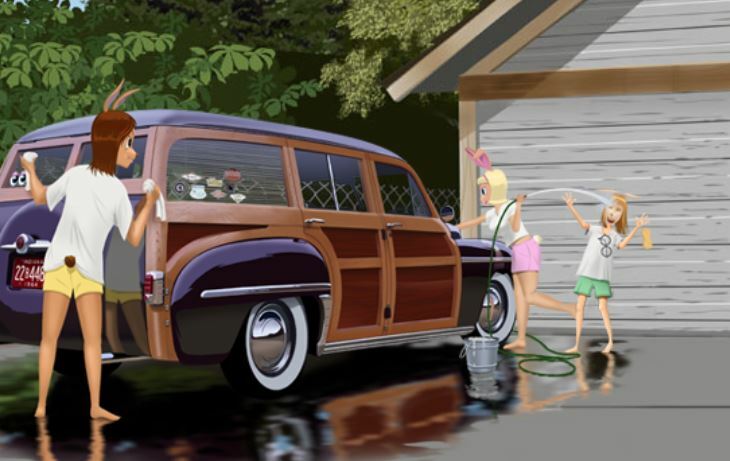 That prompted me to include that little bit of detail in Hot Rod Bunny, book one and since Beverly moon’s first car was a rust bucket ’54 Dodge. I included the rusty floorboard and the oven rack method of covering it up, with some humor of course. Anyway, My attraction for old wagons never changed. I noticed that the rest of the world caught up to me and is also collecting and hording old wagons! When I was at the Grand National last January, I cataloged a few of them for you to enjoy! 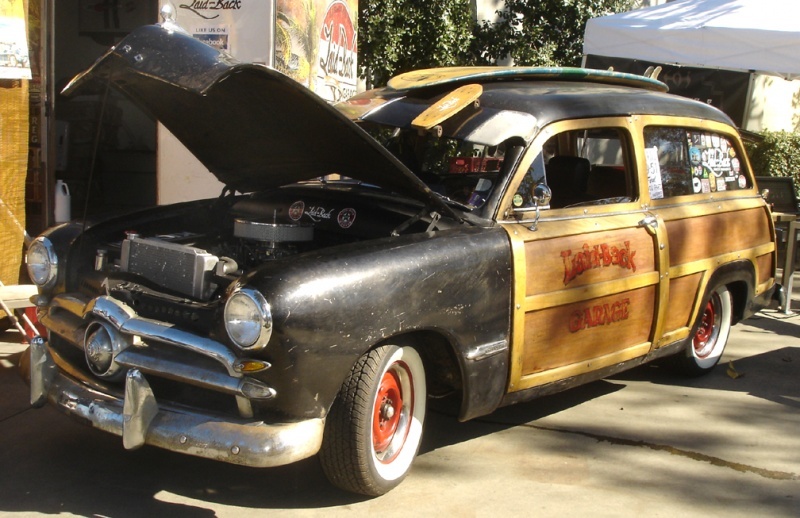 This ’49 woody was a nice original looking car with authentic patina. What’s going on with the turn signals? Did the park light assembly have babies or something? This ’55 Dodge is a car you don’t see often. 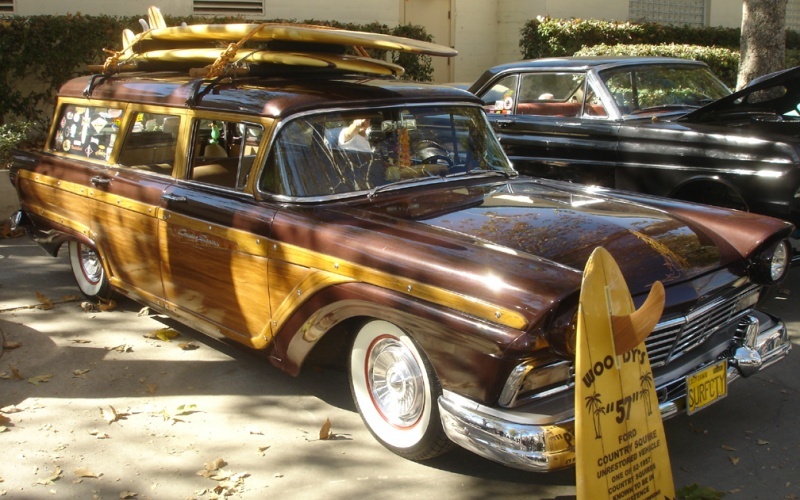 This car reminded me of the Revell ’57 Country Squire kit. It is molded in the same brown color. I still ranks high on my list of desirable cars. 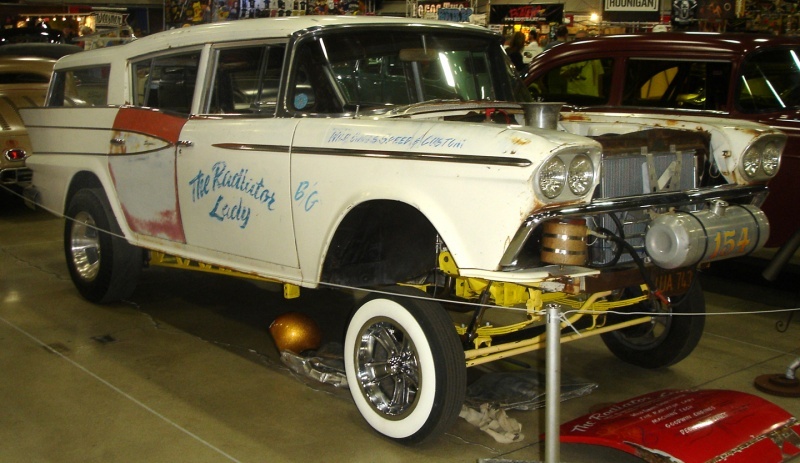 I covered the Radiator Lady ’59 Rambler in another blog but it was still a wagon and caught my eye. This ’59 Pontiac was a great car. I’d love to be driving it around! Although I’d probably put the stock wheels back on it! Keep the Fast N’ Furious for the Theaters and Drag Strip! Posted April 17, 2015 by MSH@HotRodBunnySite & filed under Uncategorized. Being the proud owner of a hot rod isn’t an experience that most people are lucky enough to have in their lifetime. It can be a lot of work to be a hot rod owner: countless hours spent tinkering, upgrading, and fixing little issues that come with having a 50+ year old vehicle. But for those of us who are owners, we know what a privilege and a great responsibility it is. Responsibility is unfortunately something too many people forget about when they are driving fast cars or Hot Rods. You see, one thing that makes a Hot Rod “Hot” is its more than ample supply of unyielding horsepower. With this type of power at your right foot’s disposal it’s easy to get yourself or others into real trouble and or harm. It’s not uncommon for a Hot Rod with a big block, upgraded fuel system, supercharger and possibly NOS to put down over 1,000 horsepower! To put that into perspective for the non-gearhead, that’s about four to five times the power of the normal family sedan. With that type of power you can cover a quarter mile from a standstill in under 9 seconds at 150 mph if not faster. If you get caught street racing there is no doubt it, it’s going to be a costly affair for you. Many states now have laws which specifically target street racing and it comes with stiffer fines and penalties. Let’s say you can afford the thousands in legal fees and court fine, but don’t be surprised if your license gets suspended or worst of all, your car gets impounded. If you cause damage to someone else’s hot rod, car, or property, forget about it. Expect long legal woes and the bills that will follow for many years to come, and you can kiss your beloved Hot Rod goodbye. Losing money, damaging your vehicle, or even losing your license are all terrible things but pale in comparison to a severe injury or death that can result from illegal street racing. Plastic and metal can be replaced, money can be re-earned, but a life cannot. Racing in the streets is unpredictable. You don’t know if the person next to you is an experienced driver, what the road’s condition may be in, if somebody else might pull out in front of you, or even wildlife that might run out. You just don’t know. At the types of speeds these incredible Hot Rods are capable of doing, it’s just too unpredictable. Get yourself to a track, it’s worth it on so many levels! No speed limits to worry about! Grip it and rip it! Everyone signs waivers, clear rules are in place and everyone has to follow them. Paying a little money to go to the track is infinitely cheaper than paying attorney and legal fees. Racing at the track typically means more experienced drivers and more fun. Going to the track can be a family affair that everyone can enjoy in a safe environment. You can’t exactly show the kids what a 150 mph is on the streets but you sure can in the quarter mile. 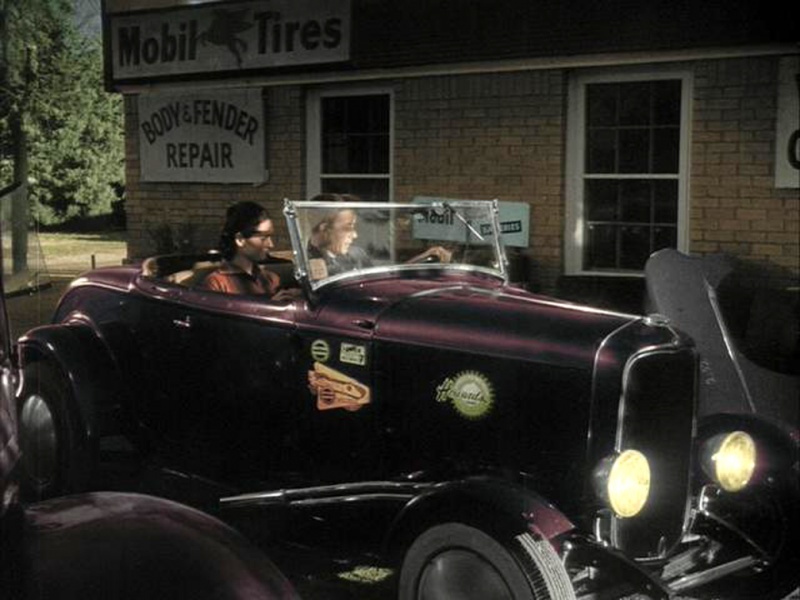 It may be tempting next time you’re at a red light and you find some knucklehead revving his engine at you, but don’t take the bait like Beverly did in Hot Rod Bunny. She got lucky. But for the rest of us, it’s not worth it. Instead put your local track on speed dial and get the 411 on the next track day. 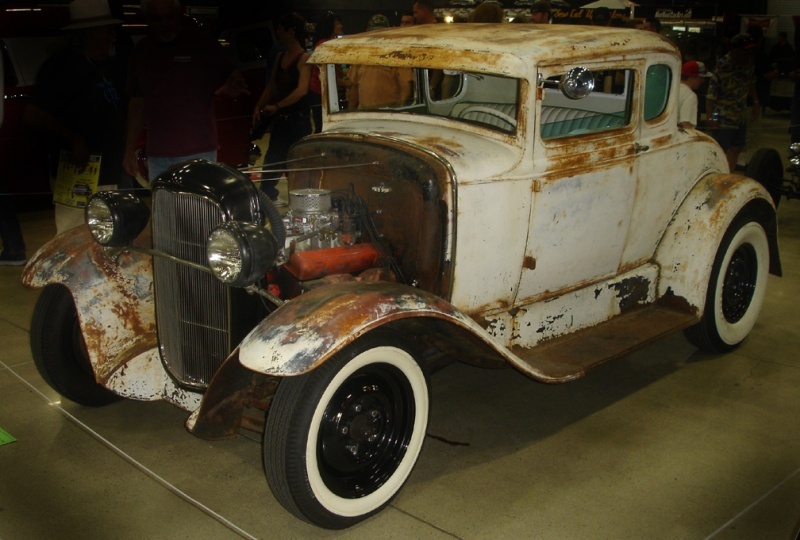 Rat Rods: Hot Rods or Rolling Heaps? Posted April 2, 2015 by MSH@HotRodBunnySite & filed under Uncategorized. 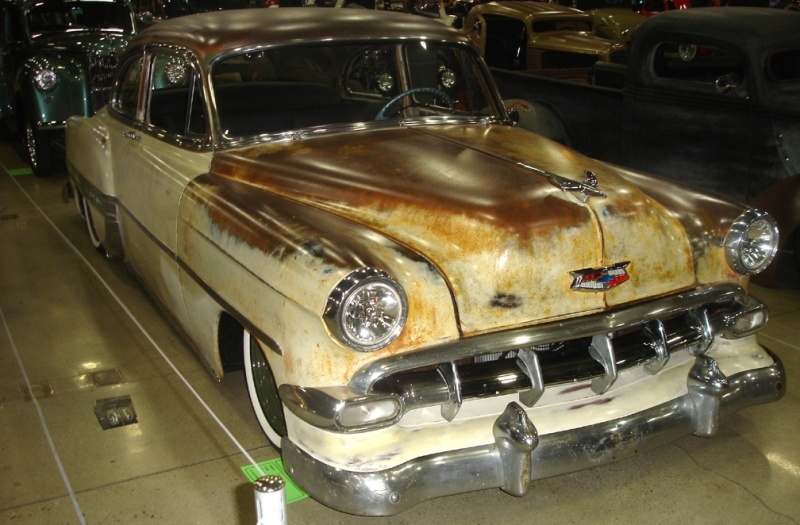 As most of you know, a recent trend in hot rodding is to rebel against the shiny trailer queens with acres of clear coat and just let the car stay rusty or even to help it along with a grinder or an acid bath. 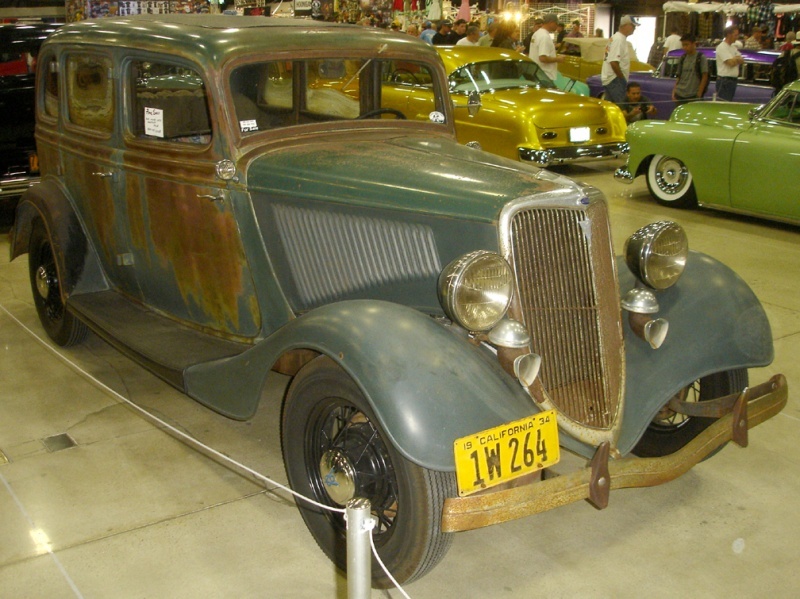 A natural “patina” or flat black primer paint job (suede) have become very popular options. 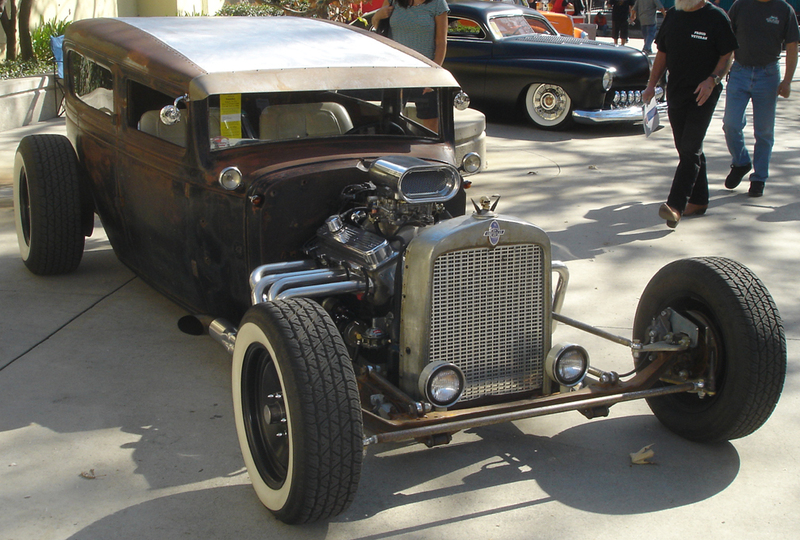 These machines are known as a Rat Rods. 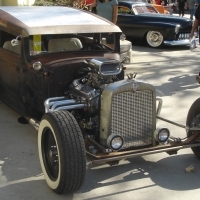 Characterized as cars that are bits and pieces of what was available, Rat Rods offer something that a classic hot rod doesn’t: authentic roughness. 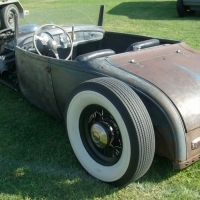 Rat Rodders started out as an alternative to the higher priced custom hot rods that we typically gaze at in the magazines. 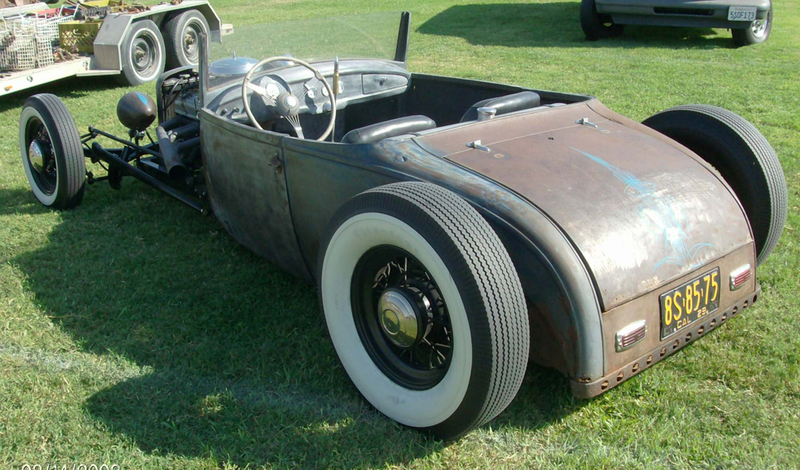 Rat rods aren’t just for decoration; these old-styled cars are built to drive. 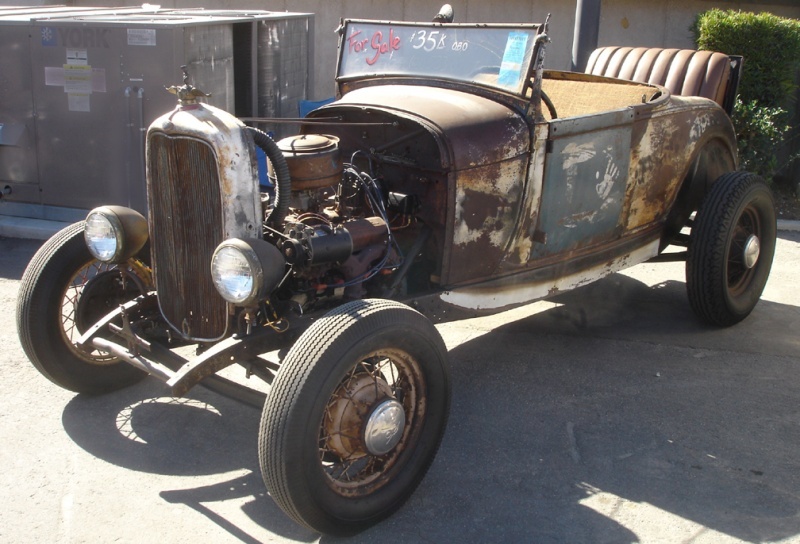 Many of the subcultures from the traditional hot rod eras can be picked up from viewing just a few rat rods. Biker, greaser, rockabilly, psychobilly, and punk have all had an influence on how these masterpieces are created. It’s a modern throwback to the real cars that just regular guys could afford back in the day. Forget the paint…how does it run? 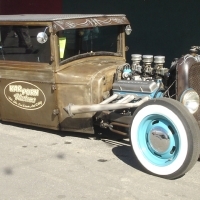 Some people feel that these rat rods are epitome of Hot Rodding with the builder’s customizing truck beds out of passenger car fenders and creating never before seen builds. However, the other side (hot rod purists) can see them as rolling trash heaps. None of the parts match and you wind up with half of a Ford and half of a Chevy concoction, all powered by a Chrysler hemi or a Buick Nail-Head. 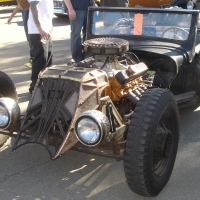 For those who really believe in rat rodding, they see rat rods as an opportunity to create a truly one-of-kind vehicle using different parts from various makes and models. Many times these cars are loud, unsophisticated and uncomfortable machines. With that said though, there is something special about them that you can’t get with any other automobile. You’re able to take your favorite bits and pieces from many cars, and piece together a one-of-a-kind ride. Just the variety of grilles used is amazing. 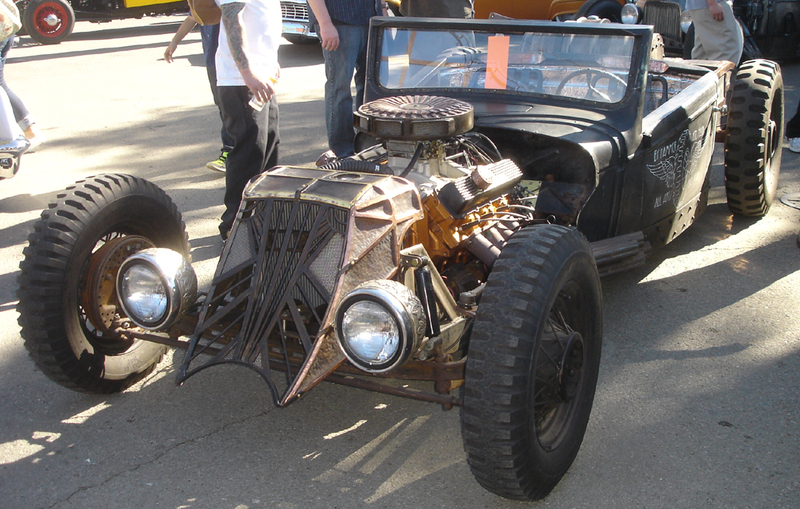 Many of these Rat Rods are also mechanical works of art. The hours of work that utilize different manufactured parts all working in harmony is nothing short of a miracle. 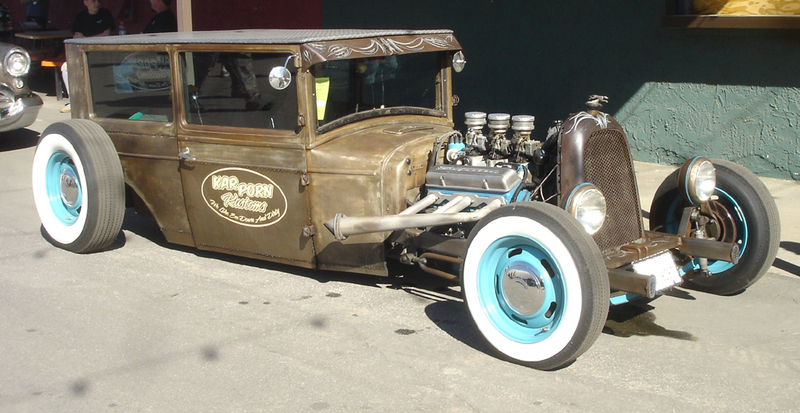 Also, all the creativity that goes into a Rat Rod is something you can’t get with any other type of build. What side are you on? 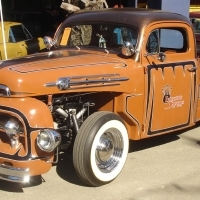 Do you like the classic hot rod builds and restorations or do you like the creativity and uniqueness of a Rat Rod? Remember, Beverly Moon from Hot Rod Bunny accidentally built a rat rod when she ran out of money and couldn’t afford to paint her car! Posted March 12, 2015 by HPGhotrodLogin & filed under Uncategorized. 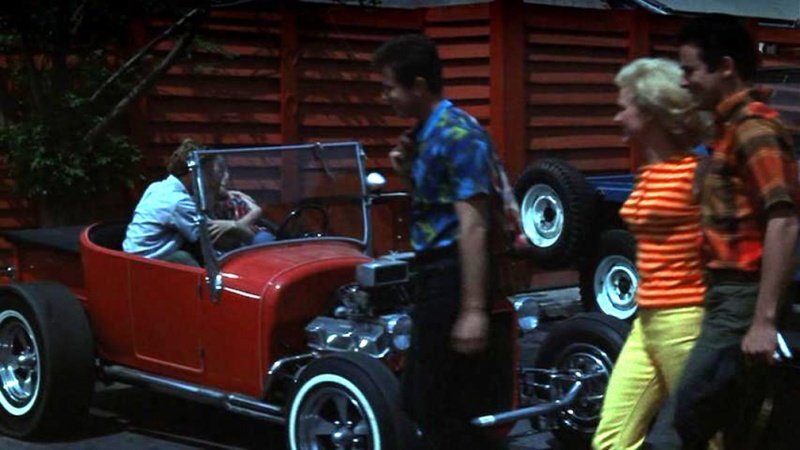 Everyone knows the famous yellow deuce coupe that was used in American Graffiti. There are many automotive icons from the movies and TV shows. A lot has been said about these cars but I like looking at the not-so-famous cars in the B movies and TV shows. Sometimes I wonder where they came from. Well I did some digging and I managed to find out the story on a few of them! This is by no means an exhaustive report but these are some of the cars that I was curious about. 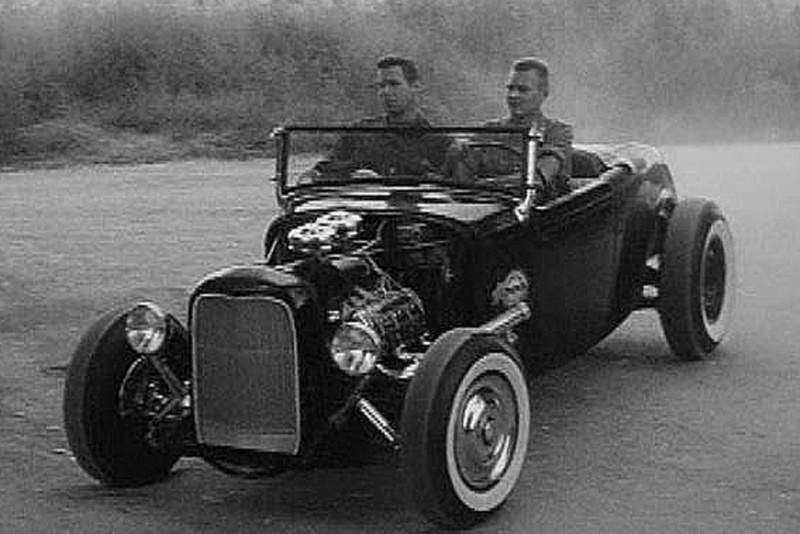 The main hot rod from Giant Gila Monster, a Ford deuce roadster, was actually a major contender at the drag strip. The movie, which was filmed in Cielo, Texas, used local automotive talent. It turns out that the car was owned by John Mulkey of Waxahachie Texas. 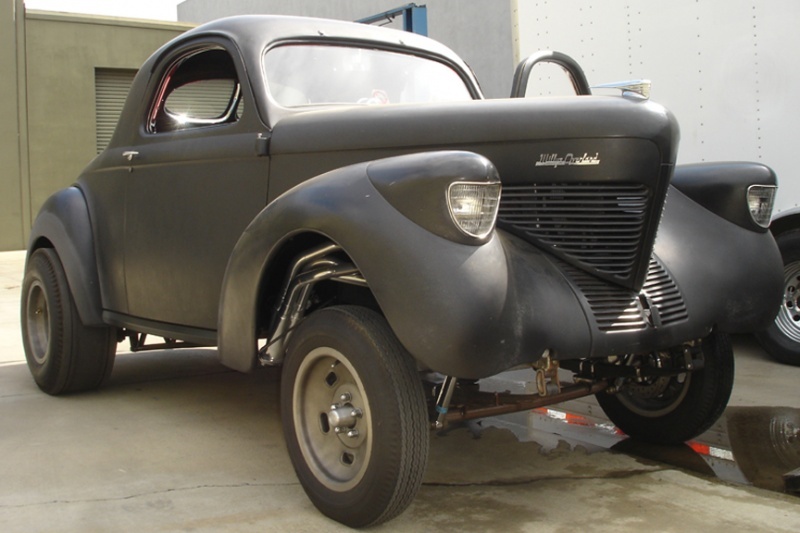 For power, it had a 302 Chevy V-8 that could turn a quick 105.50 mph. The car supposedly went through a slow finishing process in the film. 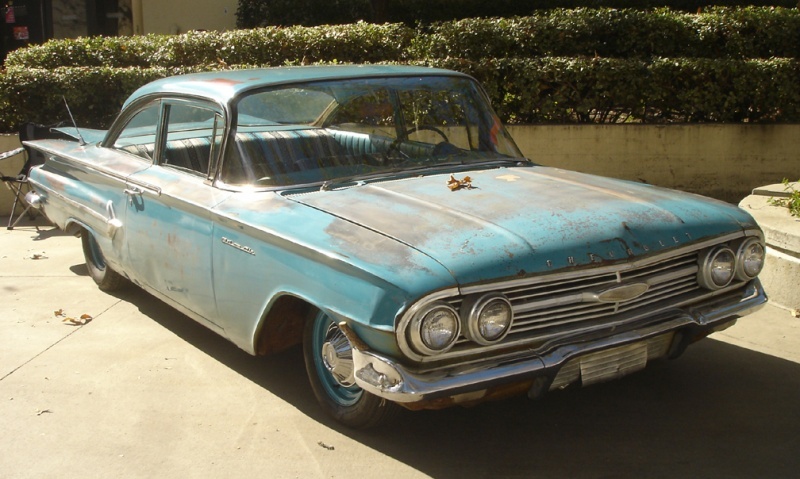 It had a bad headlight and bald tires which were replaced by “appropriating” them from a wrecked ’57 Pontiac. Finally, at the end of the movie, the car is completed and sports a shiny paint job and sponsor decals. The car’s hood makes it’s appearance for the first time in the movie also. 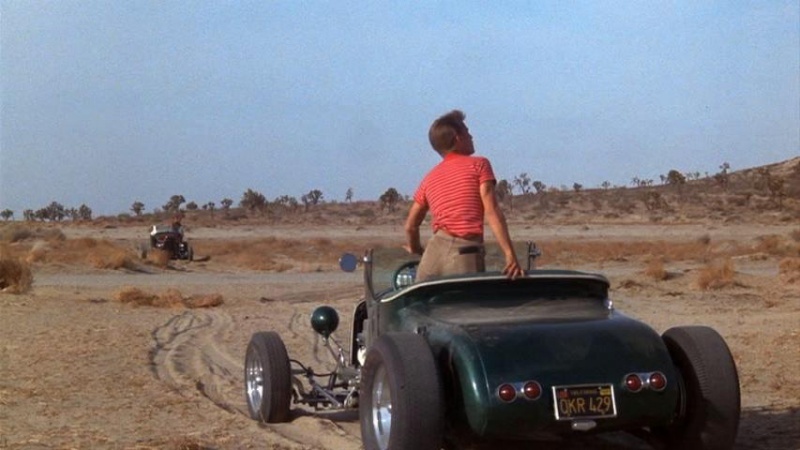 At the end of the story Chase Winstead, the hero, has to kill the Gila Monster by placing nitro-glycerin on the seat of his finished hot rod and pointing it at the beast. He accelerates and bails out just as we see the car drive out of frame. Fortunately, a model car acts as the “stunt double” and saves the day by blowing up the menacing reptile (all in 1/25th scale). 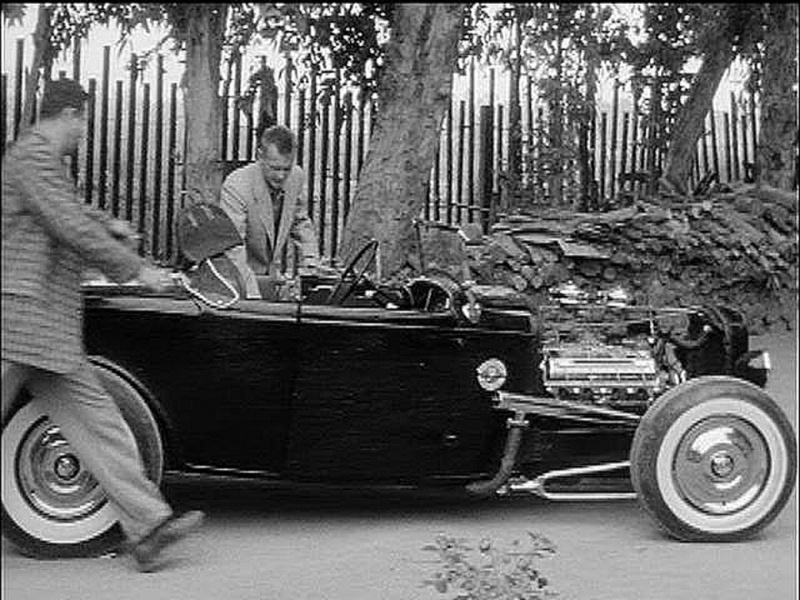 The cool ’25 T bucket Roadster pick-up in the movie, The Choppers was also a sort of famous car. Actually it had a famous owner. It belonged to the actor, and drag legend, Tommy Ivo. 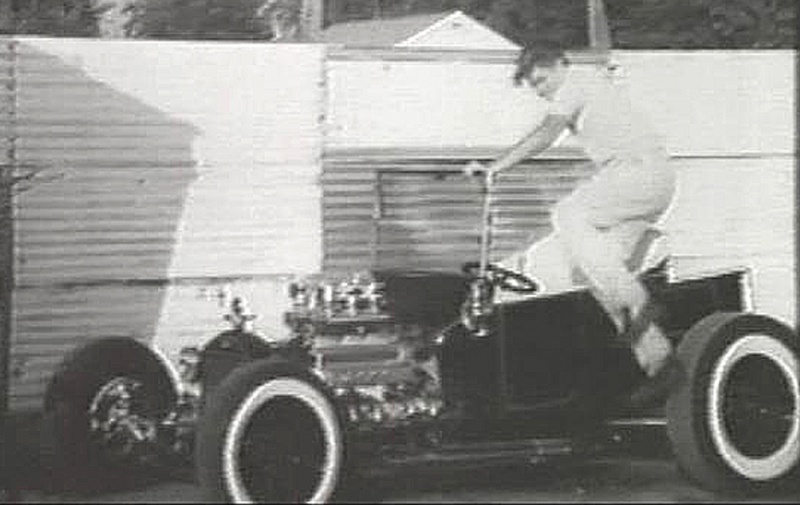 He had built the car to resemble a hot rod he saw built by fellow actor, Norm Grabowski back around 1955. Tommy’s car was made out of rusty parts found in desert junkyards. 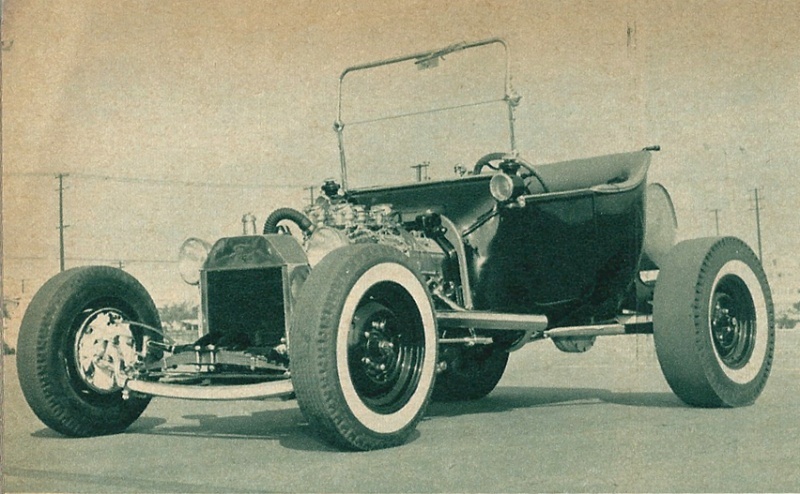 The bucket body started out as a phaeton and was cut down. Sound familiar? 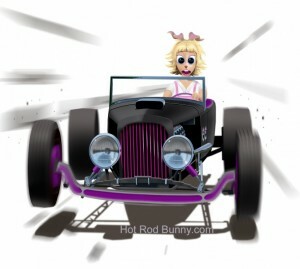 Just what Beverly Moon does in Hot Rod Bunny! 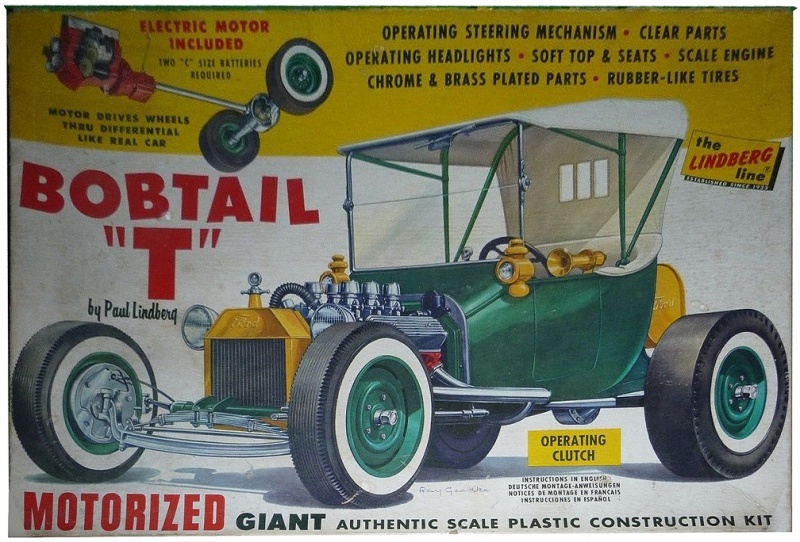 The shortened box was from a Model A as was the frame. He bought a complete ’40 Ford just to get the running gear. Tommy Ivo had a long love affair with Buick mills and his bucket pick-up sported a powerful 402. He said the film company let the car idle for hours then would drive it hard for the takes. Apparently, it needed a rebuild after the filming was over. The car also had a major roll in Drag Strip Girl. The car still exists today and the current owner restored it to look the way Tommy had it originally. 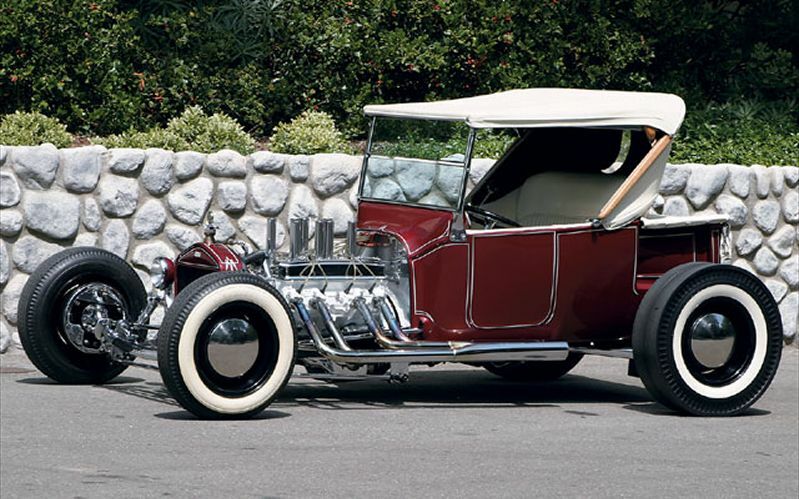 Martin Holmann’s 1915 bucket T was a car that made the rounds in movies and TV. 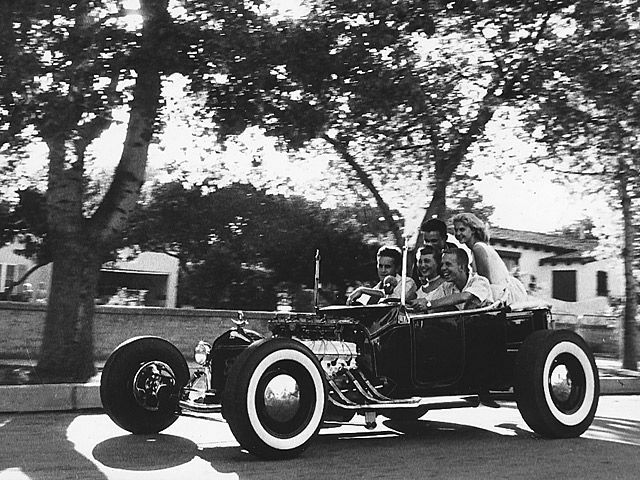 It was used as the hot rod in Disney’s Son Of Flubber 1963. It also appeared in Bikini Beach, 77 Sunset Strip and the Dobie Gillis TV show. The engine was a ’49 Olds 324 with an Edelbrock manifold and four-twos plus some cool Weiand valve covers. The car was also supposedly the inspiration for Lindberg’s Bobtail “T” 1/8 scale model car kit that was introduced back then. The likeness used without permission or royalty. The kit came with a Chevy V-8 in stead of the Olds and is still available today. 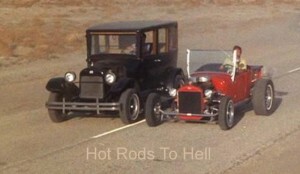 Hot Rods To Hell was a dreadful movie made in 1967 but had some first class iron tearing up the black top. The lead car was a red ’58 Corvette in desperate need of a rebuild. As it smoked its way down the two-lane, it was flanked by some pretty nice cars driven by the hoodlum friends of the main antagonists. I haven’t found out much yet about the very cool red T bucket roadster truck but it is my personal favorite. It was Chevy powered with two-four bbl carbs and some great cast aluminum air cleaner/scoops. 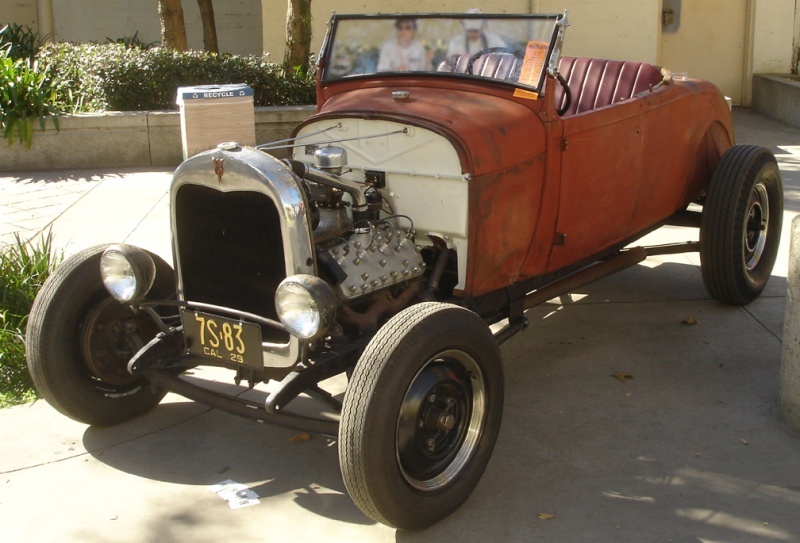 The black ’29 Model A roadster across the highway was built by L A Roadsters member Sam Conrad. 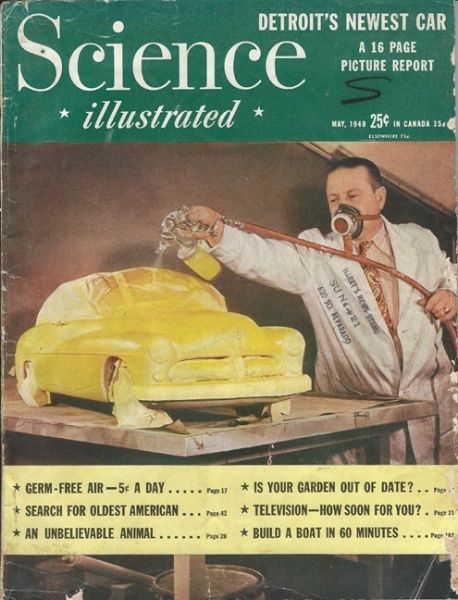 The green car in the foreground was featured in the May ’62 issue or Rod & Custom. It belonged to Gary Heliker and was powered by a Buick nail-head. The car underwent some changes and lost the fenders before it was used in Hot Rods To Hell. 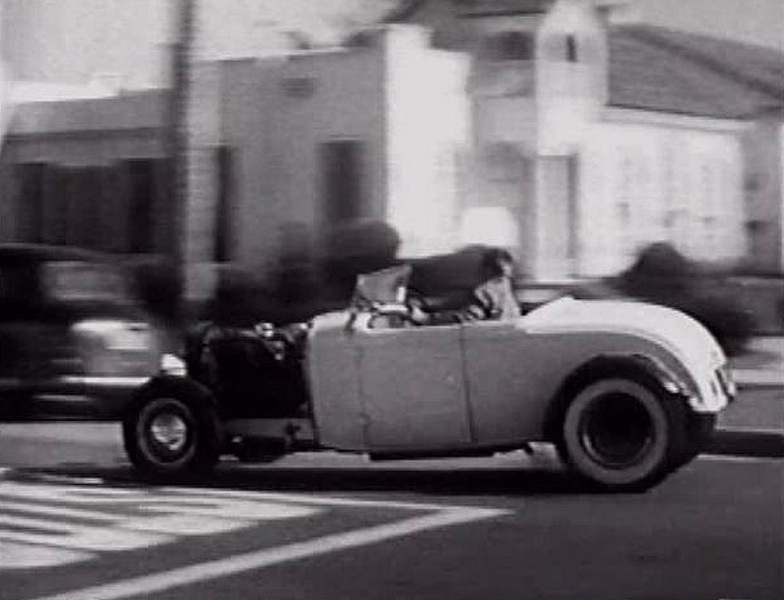 In Disney’s The Love Bug, Herbie steps up to the challenge and flies past this late 60’s style T Bucket in a very memorable street race scene where Herbie passes the street rod so fast that the driver and his girlfriend’s hair are both actually blown forward! 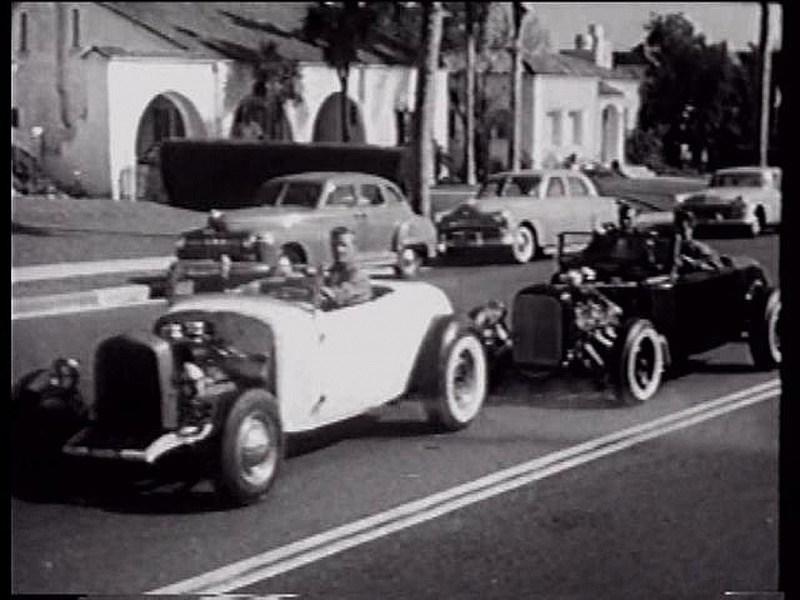 Hot Rod Girl was one of many car exploitation movies from the fifties. At the beginning of the film they show a street race that ended in the death of the main protagonists brother. Both cars are ’32 roadsters. The white car has a flathead with two-fours and the black car has an Olds engine also with two-fours. I believe this is the same car used in the Highway Patrol TV series episode aptly named “Hot Rod”. The car looks the same with minor changes to the exhaust and upholstery. Even the air cleaners are the same. 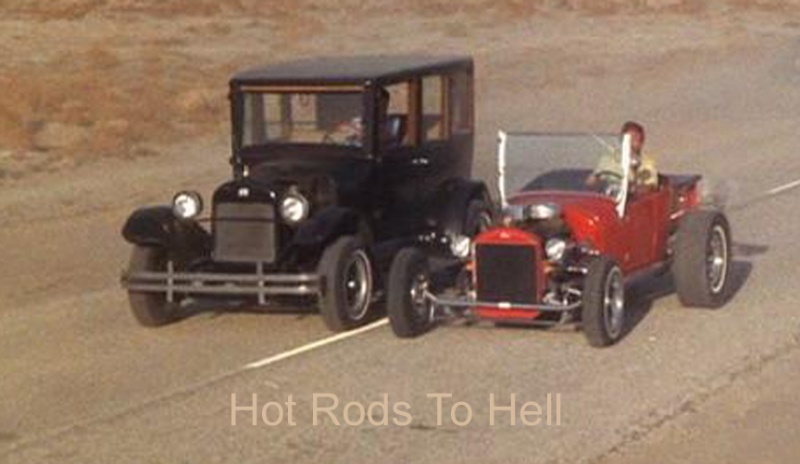 There are lots of other B movies out there with a variety of hot rods running around. I’ll have to cover them on another installment, in the mean time; buy a copy of Hot Rod Bunny. It was inspired in part by those old movies. 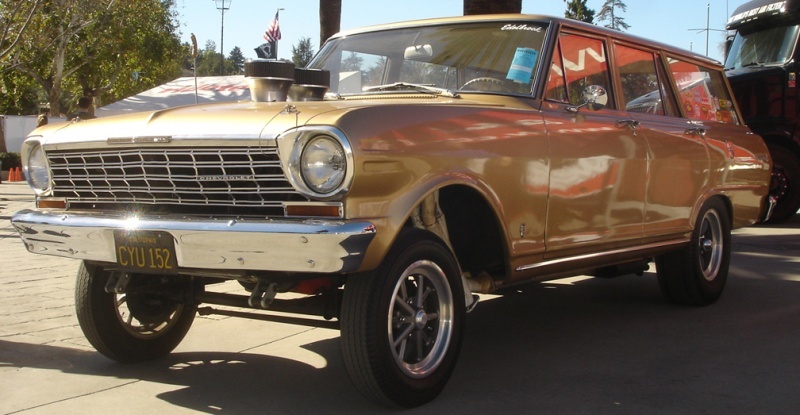 It’s humorous, very nostalgic and written for the “old skool” hot rodder to enjoy! Posted February 24, 2015 by MSH@HotRodBunnySite & filed under Uncategorized. Hotrods. They come in all shapes, sizes and colors. Some are sleek, stylish, and polished, while others may be more crude and unrefined. Some hotrods sound wonderful and run great while some may backfire and smoke. Some have beautiful candy-colored paint while others are rusty and dusty. It doesn’t matter the type of hotrod you have, it’s yours and you love it. It all starts when you are just a kid and your dad approaches you to have “The Talk”. He sits at the edge of your bed and pulls out a picture book to show you something very important that every child should know: how to build a hot rod. There are many hobbies one might want to take up. Some people like playing with model trains, or model cars, (as in my case) golfing (which I’ll never understand) or even landscaping but there’s one hobby that without a doubt stimulates all the senses. Building a Hotrod. You may ask: “what does touch have to do with building a hotrod?” Building a hotrod has everything to do with really getting down and dirty with parts and tools. When building a hot rod, not all touch may feel good but it’s always more rewarding. Being up to your elbow in an LS motor with a fan belt half cutting off circulation isn’t fun. Or when you’re trying to break free a bolt with all of your weight and it lets loose – bashing your knuckles to a pulp. When it’s all said and done and the last of the Fast Orange is washed from your cuts you know it’s worth it. For custom cars touch and feel are primary in my estimation. The swoop of the fender, the radius, the transition surfaces, everything has to work for the eye and the touch. Let’s face it; 80% of hot rodding is all about the looks. You might not have a degree in design and you might be completely colorblind, but when you see a mean looking hotrod you’ll know it. Being able to choose the colors and designs to finish your hotrod is one of the most exciting parts of owning them. And getting to see the work of others is always inspiring. Finding that right balance of paint and chrome is what sets apart the casual builder from the Chip Foose’s of the world. The highlight along the upper surfaces is extremely important. They have to flow. Great designs have the best flow. Side pipes, strait pipes, cherry bombs, and Borlas. There’s never been a hotrod that sounded like a Prius. The roar of a Hemi or an LS88 is enough to make the hairs on the back of your neck stand up. 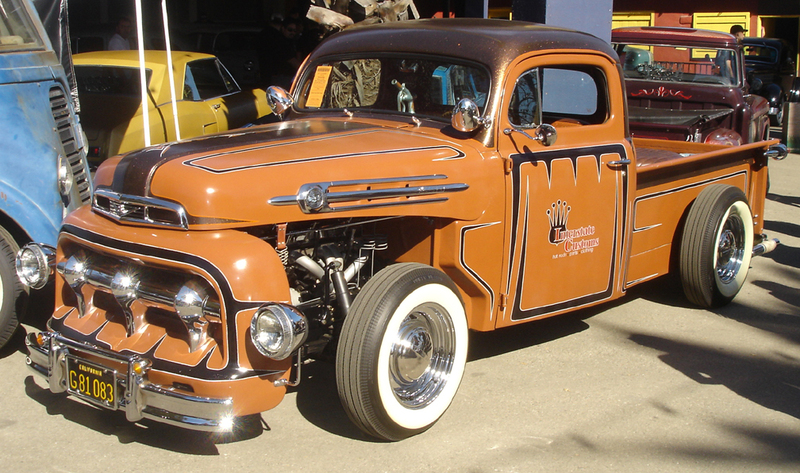 Loud, powerful engines are what hot-rodding is all about! Smell is the sense which is most closely related to memories. 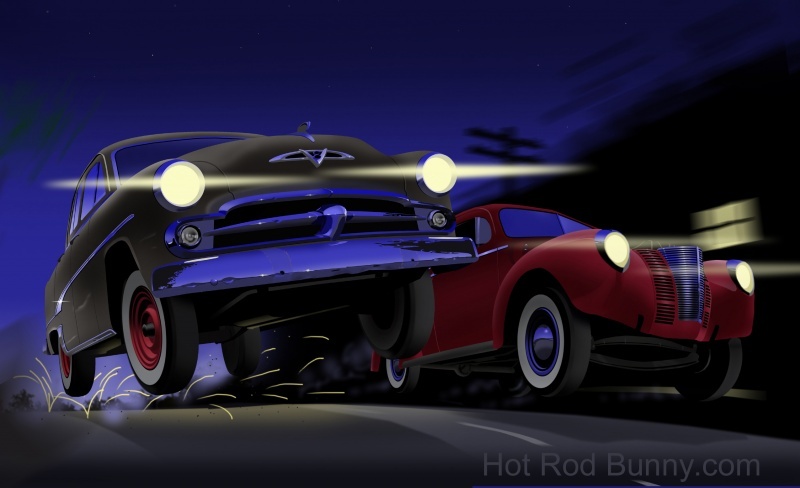 Have you ever been behind a classic car or hotrod at a light and it smells like a “Hotrod”? You’re probably smelling it running a little rich. Or the smell of fresh engine paint baking under the hood! Or the smell of new tuck and roll upholstery! For me these smells brings back a wave of memories of my own cars, mostly vintage convertibles and also walking around car shows and chatting it up with the other proud owners. Catch a whiff of hi-octane gasoline and instantly be transported to hotrod happiness. You may say to yourself, “How does taste apply to a hotrod?” I’d reply it does in a few ways. First, you obviously have good taste already if you own a hotrod. Secondly, ever have to siphon gasoline out of an old gas tank? Let’s hope you never have to know that taste. (Leaded gasoline tasted better anyway.) Finally, the sweetest taste is cracking a “cold one” (diet soda in my case) after you’ve sweat and bled over your hotrod for hours and you’ve completed the work at hand. There may be other hobbies out there that use all 5 senses but none of them are as visceral and rewarding as owning and maintaining a hotrod. How does hot-rodding appeal to your senses? Posted February 19, 2015 by HPGhotrodLogin & filed under Uncategorized. 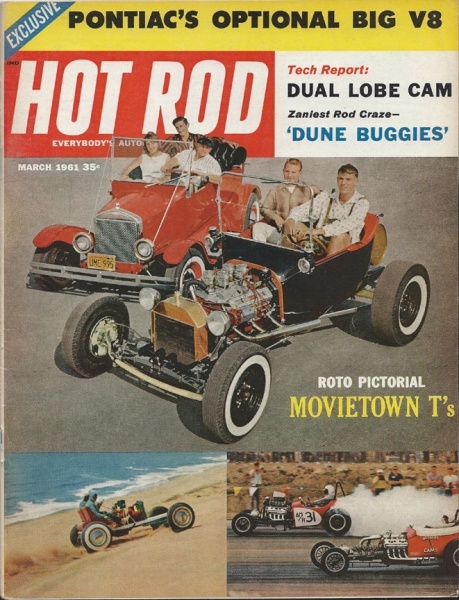 We here at Hot Rod Bunny were saddened to hear about the passing of Leslie Gore who died of cancer on Monday Feb 16th. She provided some of the best and I think iconic songs from the early and mid sixties. She had a very strong singing voice and could belt out a note with the best of them! And she made it look effortless. If you watch some of the old performances on You Tube she really does make it look like it isn’t work at all. She was born Leslie Sue Goldstein in 1946! That makes her almost exactly the same age as the lead character in Hot Rod Bunny, Beverly Moon! For those of you who haven’t read the book yet (And why haven’t you?) Beverly is 18 years old in 1964. She is being pressured to go out on a date by the local hot rod authority and cool cat, Fast Eddie. The boy that is in love with her, Tom Brewster, is pressuring her not to go out with Eddie and tries to tell her what kind of boy she should be dating. A misstep on his part but he meant well. Poor Beverly is confused and upset that two strangers are telling her what to do with her dating life! 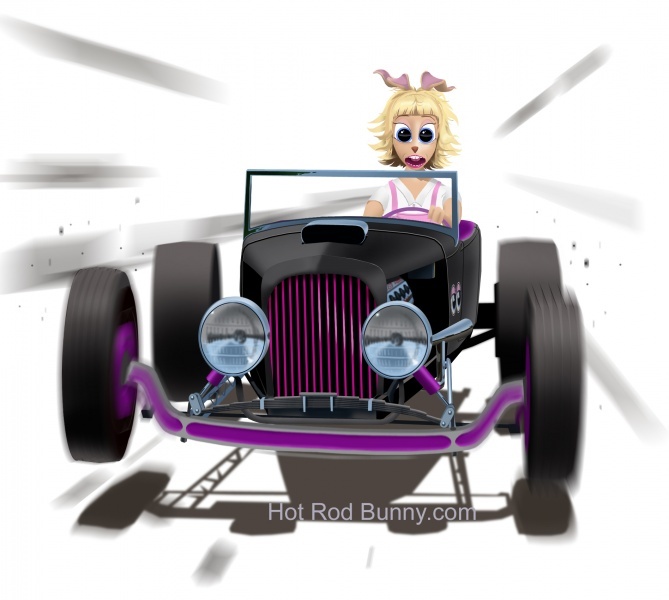 One scene in Hot Rod Bunny had her practicing for a race and listening to Leslie Gore sing, “You don’t own me” on the radio! I felt that the song was such a good anthem for a young woman to adopt as her own. It was a cry for independence in ’64 when it came out and also for the character in my book! That was one of the life lessons that I wanted to convey. The character, Beverly Moon is a genius but a bit socially naïve. One of the things she has to learn is how to handle herself around others that are a little pushy. Her confidence increases as the story goes along. She gets into some tight scrapes and weird situations and has to be a little more assertive. She also has to drive fast to try and get out of them. 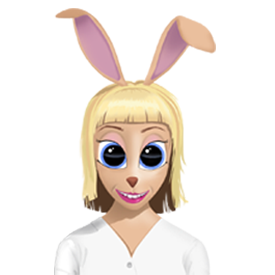 After all she is the hot rod bunny! The song, “You don’t own me” has the same meaning today for girls and my 12 year old daughter loves to listen to it and sing along! Well, we bid a fond farewell to Leslie Gore and thank her for the great songs she sang in such a turbulent era. Posted February 10, 2015 by MSH@HotRodBunnySite & filed under Uncategorized. Part of the reason why I wanted to write Hot-Rod Bunny was for my kids. My wife and I adopted older children that didn’t have the benefit of good morals being modeled for them. They needed life lessons! Now, I wanted them to know about cars, my hobby, but I also wanted them to have an interesting and confident role model. It is important – especially these days – that young girls learn that they are great the way they are. In one survey, 59% of girls in 5th-12th grades were unhappy with their body shape. I’m sure it can be said of many boys too! For me, Beverly represents something that all young women experience. She is wonderful and excels at her passions, but inside she’s battling with her own self esteem. To the outside world, her flaws are hardly noticeable or even admired. Beverly’s prodigious car knowledge and great personality are both things that everyone admires about her. As Beverly transitions from a young lady into an adult, we see her blossom into someone fantastic. The flaws she thinks she sees in the mirror are actually things that other people admire about her.That is what I wanted my children to see – that despite what the world says about your flaws, you are unique and have tremendous potential! The same story applies to Cynthia; who at the beginning of the story is a young girl who struggles a lot with her self-image. 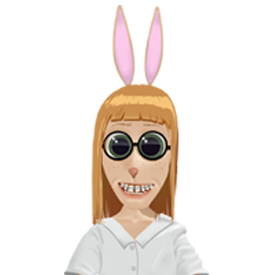 She’s got bright red hair, big teeth, thick glasses, and knobby knees. By society’s standards, Cynthia is in what many people refer to as their “awkward years”. But by the end of the story (Cynthia’s 17th birthday) she gets her braces removed and she’s a tall, leggy, beautiful girl. She grew into her looks. And while both Beverly and Cynthia started the story with physical flaws, it’s those same flaws that we learn to love them for later. All three girls have physical characteristics that make them uniquely who they are; Beverly has her oversized ears, Cynthia has her big eyes and big teeth and Brunhilda has her sarcastic smirk with one eye brow that’s constantly raised. But they wouldn’t be who they are and lovable without these “flaws”. 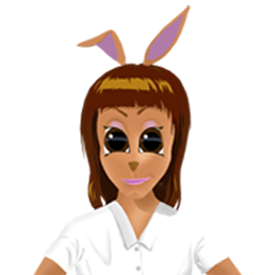 You’ll notice that in the Hot-Rod Bunny series, each girl has a different body type and different skin tone. There is a girl for everyone to relate to in these stories. For girls these days, it’s important to have a clear definition of success beyond physical appearance. And that physical appearance is only temporary, our bodies are always in a state of change. The girls in the story all started out with a very minimalistic upbringing at the orphanage. They didn’t have a lot, but they had role models and a strong father figure who taught them well. (That’s a hint guys!) Despite the circumstances that made them orphans, with hard work and diligence they still managed to find their own forms of success. At the end of Hot Rod Bunny book, we find out where they were headed in life. The bright futures they were pursuing. The following three books cover the humorous stories on how they got there and the incredible adventures they had along the way!